I held off reading Anthony Bourdain’s book Kitchen Confidential for years. I love eating in restaurants. The scuttlebutt about the book was that it “blew the lid off the restaurant industry.” I simply wasn’t prepared to have my eyes opened to this. Fortunately, in a sudden bout of urgent audiobook buying before a recent trip to Halifax, I bought the audio version of the book, read by Bourdain himself. And Catherine and I, along with G., along for the ride, entertained ourselves by listening to a good part of it on our way over and back. I finished it off during my repeated midnight rides to Moncton a couple of weeks ago. The scuttlebutt was wrong. Yes you do get to hear that restaurants recycle the bread in their bread baskets. You do get to hear that Monday is not a good day to order fish. But this lid-blowing information is limited to a short section in the second chapter called “From Our Kitchen to Your Table.” And even then it’s not particularly lid-blowing: there aren’t the tales of salamanders and health inspectors and rancid lettuce that you might expect. I gained confidence in the restaurant world from reading this chapter. The balance of Kitchen Confidential is an autobiographical sketch of Bourdain’s life inside New York kitchens. It’s wry, witty, hard-edged, and very, very compelling. I enjoyed it. I regret not having bought the book sooner. If you’re interested in food or restaurants or even just “colourful North Americans with interesting lives,” you will enjoy this book. When I get interested in something, I get interested in something. The around the world travel thing is still stuck in my craw. There was the time I forced Catherine to watch the collected works of Frank McCourt while she was pregnant (astute readers will recall that Angela’s Ashes is filled with considerable baby death, which is not good pregnancy entertainment). And the time I essentially dropped out of university to read everything written by Robertson Davies followed by everything written by Margaret Atwood (except the poetry, of course). Needless to say, I’ve started an exploration of the Bourdainoverse in a similar fashion. 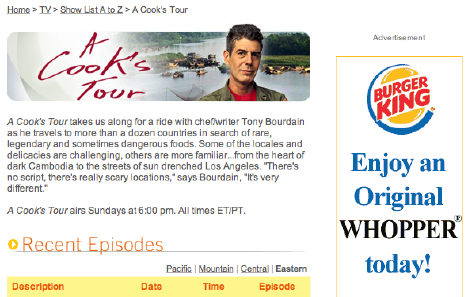 In A Cook’s Tour, Bourdain travels the world and eats. Interesting things. In interesting places. Bourdain is good on camera: wry, interested, funny. It’s good television. You can watch the show here in Canada on Food Network Canada. There’s a great episode coming up on Sunday afternoon shot in San Sebastian, Spain that I watched last night. It made me want to jump on a plane. The show has spawned a book of its own. And being published this fall is another book, Anthony Bourdain’s Les Halles Cookbook: Strategies, Recipes, and Techniques of Classic Bistro Cooking. In other words, my addiction can be fed for a while longer. Written August 6, 2004 at 1:03 p.m.
I’ve got a copy of the cook’s tour book — I’ll bring it in to you next week. It’s even better than the show (treads some of the same venues, but still interesting). After reading the book a couple years ago I’ve been recommending it to everyone. I even managed to have dinner at Les Halles when I was in New York, though I’m not sure Bourdain himself was present.